One of Atlanta's trendiest shopping neighborhoods. Located in the heart of Buckhead, just west of Peachtree Road and Roswell Road, between West Paces Ferry Road and East Andrews Drive, Buckhead's West Village offers an array of quaint and unusually eclectic shops, galleries, restaurants and businesses. 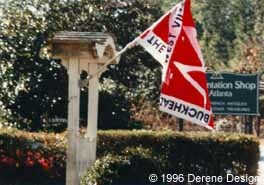 The Buckhead Village Merchants Association is dedicated to preserving the unique character of the Village. The group of retailers, bars, restaurants and property owners is focusing on safety, parking, pedestrian appeal and commercial balance. Among its major initiatives is preventing those under 18 from entering bars in the Village, where some bars had allowed teens to party, but not to drink. The BVMA also is hiring additional police officers at night and has hired an engineer to recommend streetscape redesigns to make the area more pedestrian friendly. Rated Best Overall Men's Shop 1999 by Atlanta Magazine. Rated Best Perennial Inspiration 1999 by Atlanta Magazine. Rated Best Kitchen Concepts 1999 by Atlanta Magazine. Grand opening December 3, 1999. Rated Best Sybaritic Bathroom Source 1999 by Atlanta Magazine. Andrews Upstairs is an upscale music and entertainment venue featuring live regional and national music and late night dancing with Atlanta’s hottest DJs. Buckhead Pool Hall, 30 Irby Avenue. For more than 50 years, the pool hall has been a storied hangout for students, professionals, cabbies, police and politicians. Opened in 1946 by James Lunsford, later owned by Gene Loudermilk and now by Mike Dowdle, it is the oldest bar in Buckhead. One of the most popular commercials in Europe for Levi's jeans was shot there, as were parts of a video on baseball legend Hank Aaron and numerous music videos. Minnesota Fats, one of the best pool players who ever lived, played there in 1957.